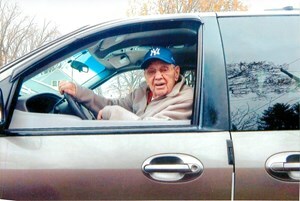 Reginald J. Lincoln, 91 of North Syracuse, NY passed away peacefully at home. Born on March 13th, 1927 to the late Thomas and Alice Ada Lincoln . He worked for UPS for several years, was an avid bowler, golfer and proudly served in the Canadian Army as a tank driver. Survived by his very loving wife, Audrey of 43 years; children, Mark (Laura) and Sherry (Val); 5 grandchildren and 2 great-grandchildren. In lieu of flowers, donations can be made to Hospice of CNY. To share a memory of Reginald or leave a special message for the family, please click the Share Memories button above. Add your memories to the guest book of Reginald Lincoln. Uncle Reggie was always present while I was growing up next door, and he always snuck me candy when I was nearby. I will miss him very much. My thoughts are with his family. My sweet, funny, adorable uncle will be greatly missed. His and Audrey's was a rare, real love story - inspirational to us all. I'm so glad we had a chance to see each other last summer, and in Uncle Reg's lucid moments, he showed us that he had never changed through all the years, and that he was still a scamp, with a joke and laugh for every situation! Rest well, dear Uncle Reg. Love, Nancy & Bob Ungar (Lincoln). So sorry for your loss, Audrey. I haven't seen my Uncle Reg in many, many years, but I do have many fond memories of him in his younger days in Montreal. He was always in a good mood and smiling! And he was always very nice to his nieces and nephews. Thinking of you and your family at this difficult time. I worked with Reg for many years at UPS. He was a good person and a good driver. He will be missed. Sincere sympathy to the family from an old friend of Reg, Roy and Lois.